Geoff Meads writes for a living and asked for a studio set on a slope within a paddock adjoining his house. 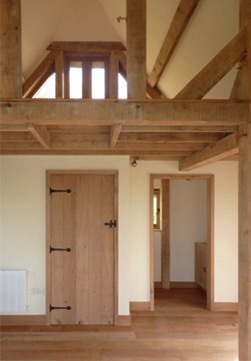 The setting is wonderful and affords views down onto a nearby farm. And although Geoff declares he is too engrossed in his work, the vista is quite fabulous, and watching the activity and weather playing across the valley’s contours must be inspiring. 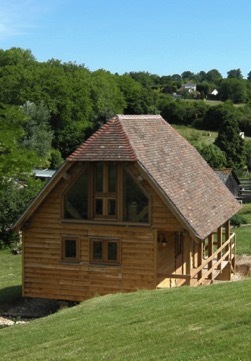 The studio evolved into a staddle stone barn, with the result that it is now known as the Whaddon Granary. 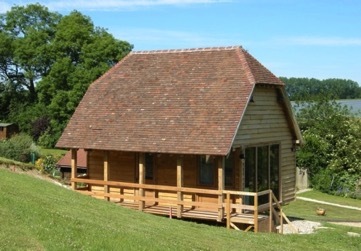 The building has all the facilities to be an independent living unit, complete with sleeping loft, kitchenette and shower room, such that when on a literary roll, Geoff can keep his head down and keep working long into the night. 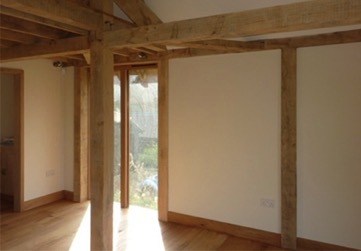 Staddle stone oak framed barns enjoy the advantages of limited foundation costs and the ability to stand on sloping ground or archaeologically sensitive sites.